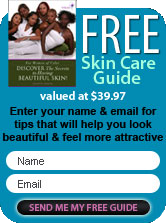 There are many different moisturizers marketed for the purpose of caring for African American skin. They are designed to protect your skin from dryness caused by extreme weather conditions, lack of humidity in your living environment and to hydrate your skin. While moisturizers are typically thought to be best used in colder climates for African American skin, it's extremely important to take care of your skin whether it winter, summer, spring or fall. What role does a moisturizer play in your skin care regimen? Moisturizers play an important role in your daily black skin care regimen if your skin is not properly balanced. Properly balanced can take into account your dietary habits as well as the ingredients you use in a given product. Ingredients determine what moisturizer to use at any given time of the year. When the temperatures are on the rise, your moisturizer might best be one that is water based, especially if you traditionally have oily skin. Warm weather has a tendency to trigger your skin to produce more oil. When this happens, you run to soaps that you hope will help in minimizing the oil production. Instead of soap, use a cream based cleanser one that will react more gently to your skin. The more soap you use the more your skin is stripped of its natural oil. This causes your brain read the condition of your skin as dry and send in more oil. In humid or hot climates, an oil based moisturizer tends to increase the oil production and lead to inflammation or clogged pores. You can still experience dry skin in a humid or warm climate, so don't think that because the temperatures are on the rise, you don't need a moisturizer. The moisturizer you use will all depends on the ingredients and the individual needs of your skin. When you look at ingredients that are used to moisturize your skin, look for ingredients such as hyaluronic acid, jojoba oil, Shea butter, mango butter, rose essential oil and of course water. Water, both internally and in your products become the driving force for well hydrated and moisturized skin. Drinking more water for some of you, will eliminate a lot of your skin care challenges, not to mention being more conscious of the foods you eat. The moisture that's lost from your skin, is often the result of poor dietary habits, in addition to the weather conditions and products you use. While you may not need a moisturizer every day of the week, it's still a good idea to be mindful of what you use on your skin, what you eat to nourish your skin from the inside out and your lifestyle choices in general.